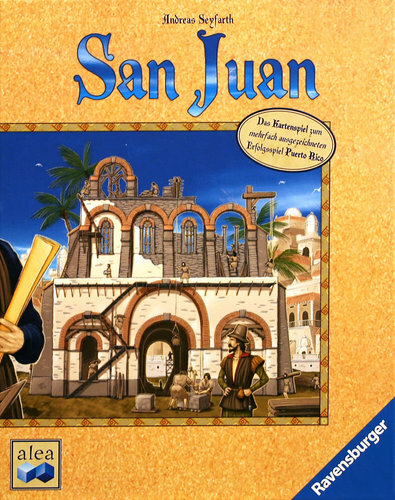 A card game based on the Puerto Rico board game. The pack of 110 cards consists of production buildings (indigo, sugar, tobacco, coffee, and silver) and "violet" buildings that grant special powers or extra victory points. Cards from the hand can be either built or used as money to build something else. Cards from the deck are used to represent goods produced by the production buildings, in which case they are left face-down. A seven-card hand limit is enforced once per round. In each round or governorship, each player in turn selects from one of the available roles, triggering an event that usually affects all players, such as producing goods or building. The person who picks the role gets a privilege, such as producing more goods or building more cheaply.